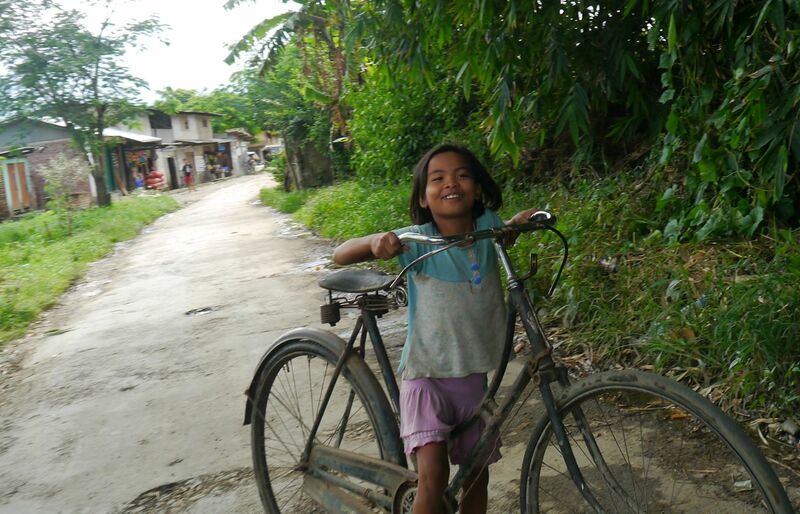 Having never been there, my perceptions of India’s Northeast are superficial. I believe it is a region of hill stations, tea plantations, and a thousand separatists; but beyond that I know little. 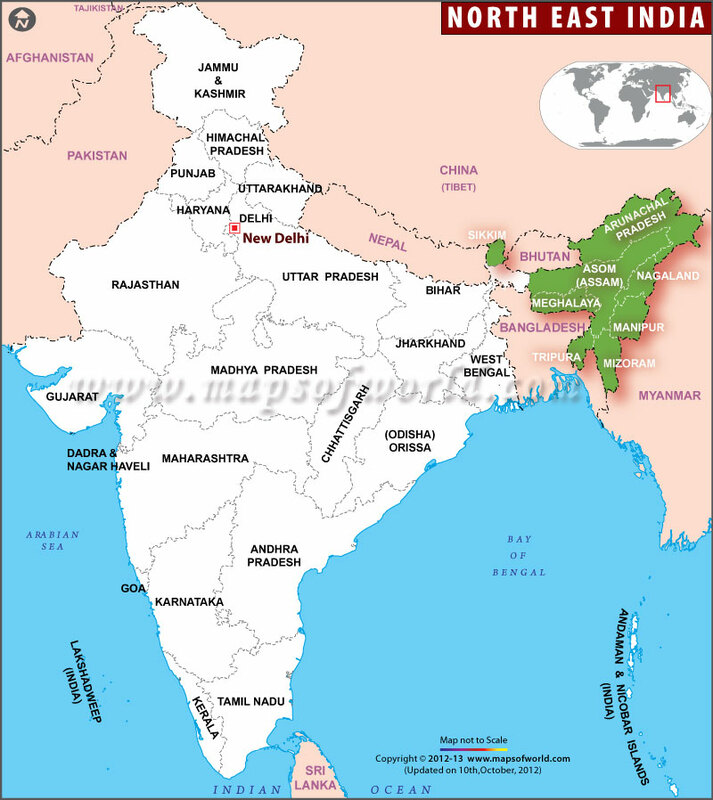 If you look at a map of South Asia, you will see that the long journey of nationalism and statehood has left India with this chunk of territory, the Northeast, connected to the rest by an extremely narrow passage, which almost looks like India’s little pinky, holding on desperately (see map). After repeated warnings about the dangers—landslides, strikes, insurgents—of navigating the windy, pot-holed 15-hr drive from Guwahati to Imphal, Manipur’s capital, Kirit and I take our first flight of the trip, a breezy 45min journey over the hills. 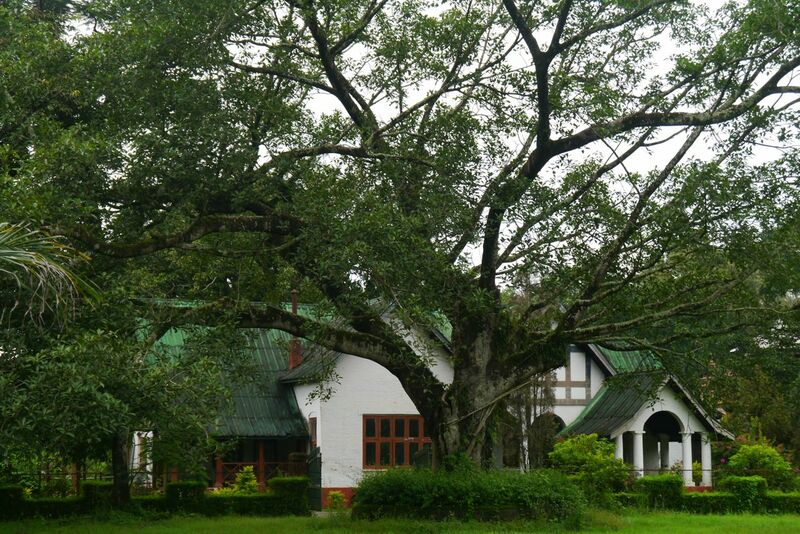 Manipur is the kind of isolated place where it really helps if you have a local contact. Not for the first time on this trip, Facebook comes to the rescue. When Anand Samuel, a US-based Singaporean friend, finds out on FB that I am visiting Manipur, he hooks me up with his Manipuri friend in the States, Rojita Abujam. 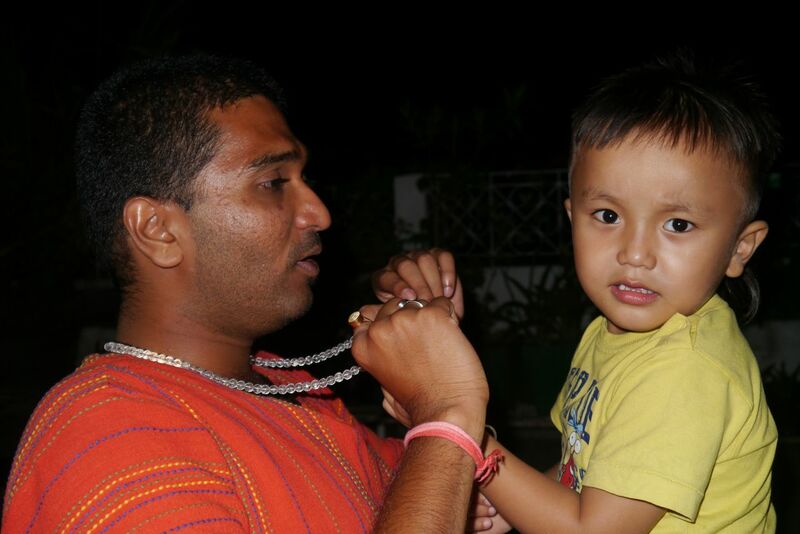 After we chat for a bit, she in turn introduces me to her brother, Roshan, in Imphal. Over seven splendid days there–longer than we’ve spent in any other city on this trip–Roshan, his wife Pushpa, their friend Naobi, aka “Bro” (all three pictured, Bro on left) and numerous Thang-Ta gurus play host to us. 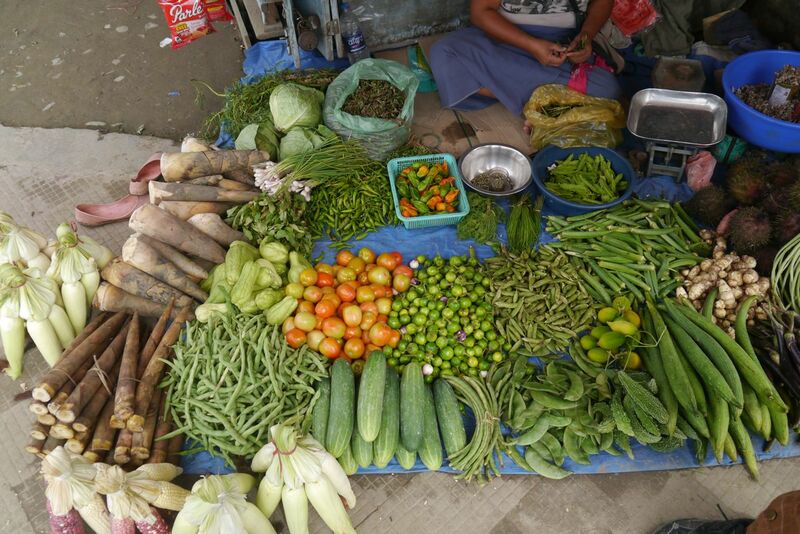 Manipur delights and surprises us in so many ways, and will probably demand a not insignificant part of my book. For now, however, as I am time- and Wifi-starved on the road from Nepal – Tibet – Chengdu, I will simply share ten fascinating things about the wonderful land of Manipur. 1. The crossroads of India and South-east Asia. 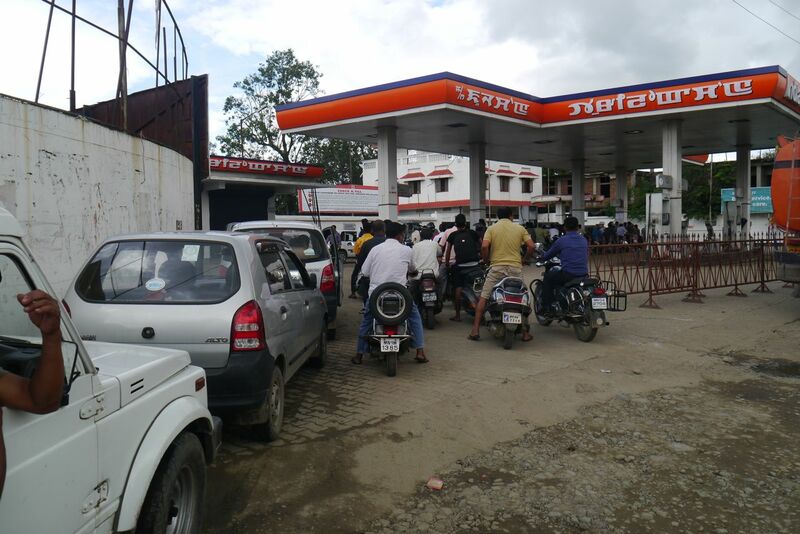 When we finally reach Imphal, Manipur’s capital, I experience serious cultural dissonance. Am I still in India? Or have I crossed into South-east Asia? Imphal is physically closer to Bangkok, Chengdu and Hanoi than to Delhi. 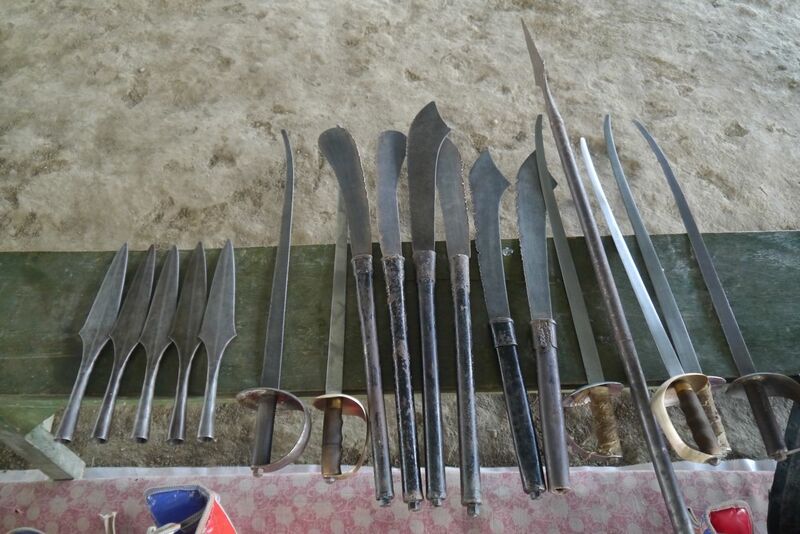 It is a mere 105 kilometres from Moreh, the town on the Myanmar border, where consumer goods as well as—allegedly—drugs and guns change hands. Having been born in Singapore, having studied Malay instead of any Indian language, and having travelled more extensively in South-east Asia than India, I have always felt a greater sense of familiarity in the former. 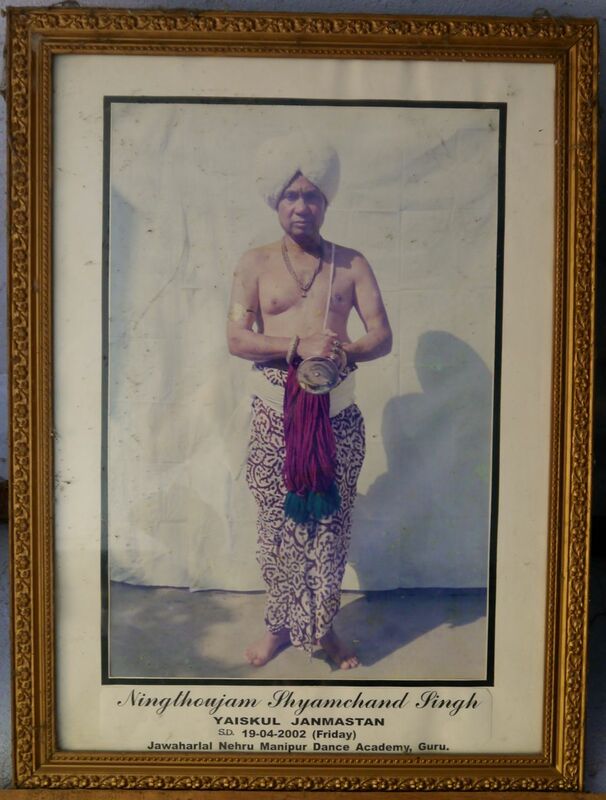 Manipur, in a strange way, brings together my ancestry and my upbringing. 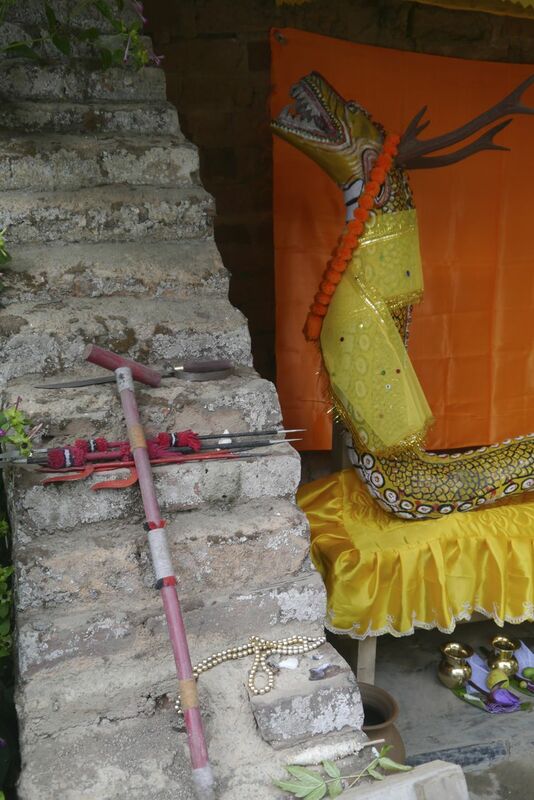 I feel completely at ease, including with the food and with the people, whose demeanour seems similar to the Thais. 2. People. 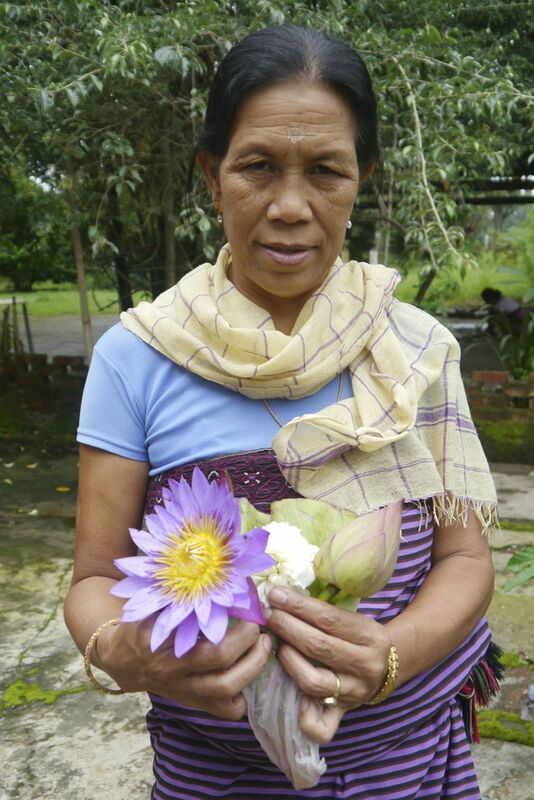 Manipuris are instinctively friendly and hospitable. They also look unbelievably young. This could be because of their healthy diet or that they take very good care of their skin (rice farmers pictured with yellow paste on face). According to Pushpa, when Manipuri women get together, they lie unashamedly about their age, lopping off up to ten years. Simply because they can. 3. The spontaneous rawness of life. On our second day there, Bro tells us to call him in the evening when we’re done with our Thang-Ta interviews. I try repeatedly from 4pm but keep getting an “Out of service” message. No bother. Kirit and I are tired from the bender the night before, and it’s the first Saturday of the English Premier League, so we have a quiet night in. When we see Bro the next day, he has a big, open scar on the left side of his face. We learn that the previous afternoon he had ridden his motorbike a couple of hours out of town to a fairly remote village that was celebrating Manipur’s annual pineapple harvest festival: a revelry of sweet, ripe pineapples and lashings of rice wine. On the ride back, well after midnight, Bro’s bike skids and his face hits the tarmac. 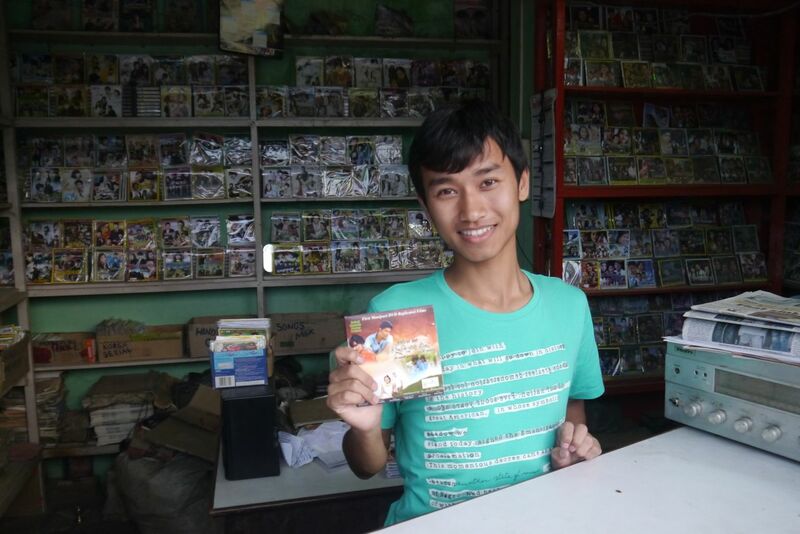 Incredibly, Bro is back on his feet immediately, and is showing us around town on Sunday, and sharing more stories about the Manipuri joie de vivre. Bro is undeniably one of the characters of the trip, historian, joker, lover of tradition and bulwark against parochialism. I have several friends who could reasonably lay claim to being the inspiration for “The Dude”, Jeff Bridges’ unforgettable character in The Big Lebowski. I now realise they are all pretenders—Bro is the Dude, maybe even better than the Dude, given the cultural complexity of the Manipuri people. 4. Religion. Almost half the Manipuris are Hindus, after a mass conversion in the eighteenth century led by their king, Garib Niwas. 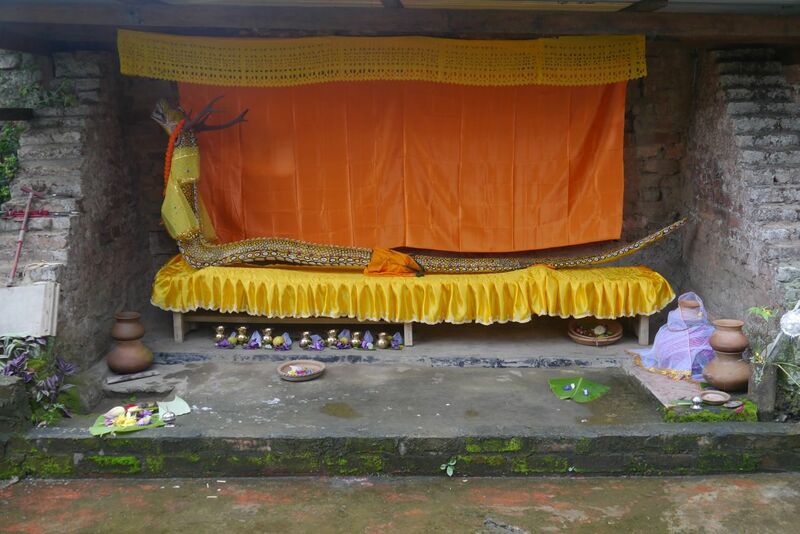 However, the Hinduism here is a syncretic form that has absorbed many animistic beliefs from Manipur’s past, including a reverence for the giant dragon God, Pakhangba (pictured). Interestingly, today it seems like some Manipuris are rethinking their quiet acceptance of an Indian religion. 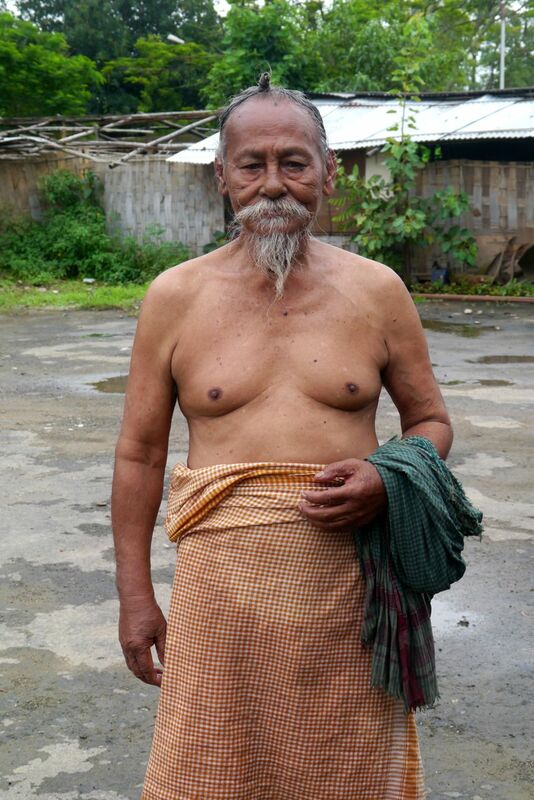 A couple of older men I spoke with do not want to pass on their Hindu-influenced surname, “Singh”, to their sons, opting instead for a traditional Manipuri name. Religion in flux. 5. The purest “martial” art? 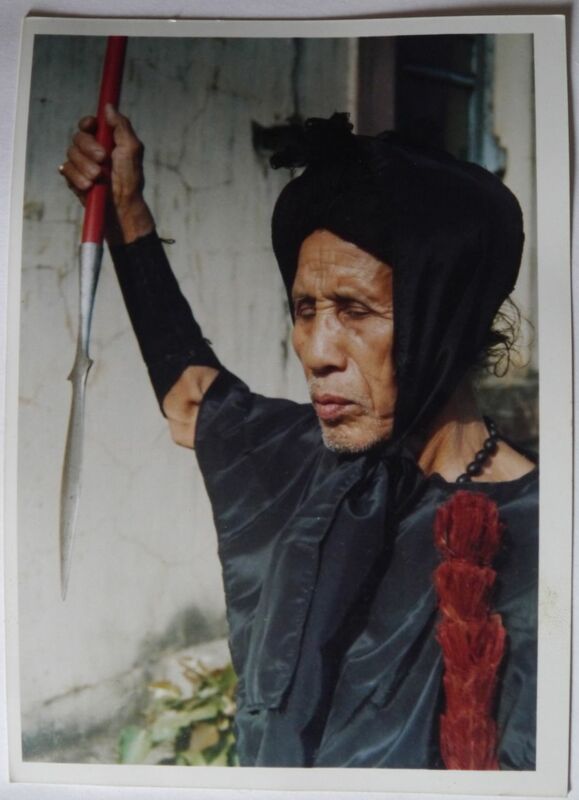 Most martial arts that I will be encountering on this journey are practised by a select group of people in a community and have not really been used in a “martial” sense for centuries. 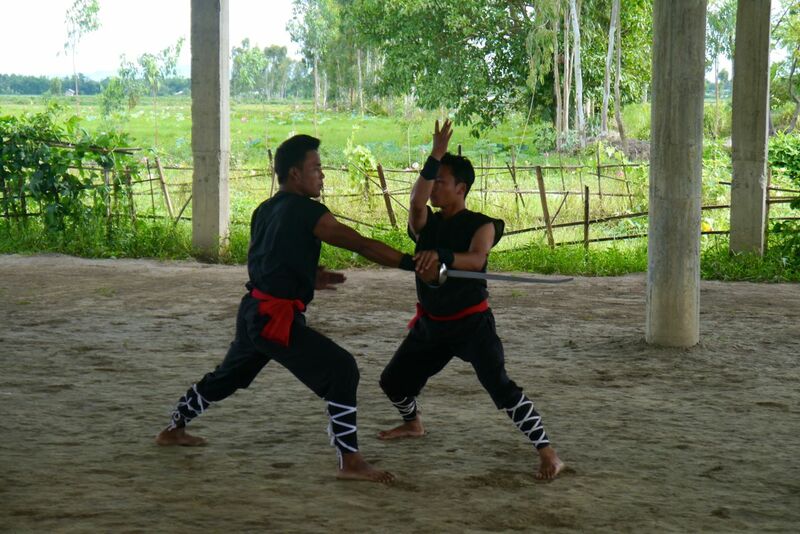 Manipur’s Thang-Ta, by contrast, is meant to be learned by everybody. One of the most dramatic and unexpected performances we witness involves two middle-aged ladies swiping at each other with peeling knives, like an episode of Housewives Gone Wild. Meanwhile, Thang-Ta was also used fairly recently: against the British, who banned it and forced it underground, where it survived in the living rooms of gurus who taught at night. 6. Sports. 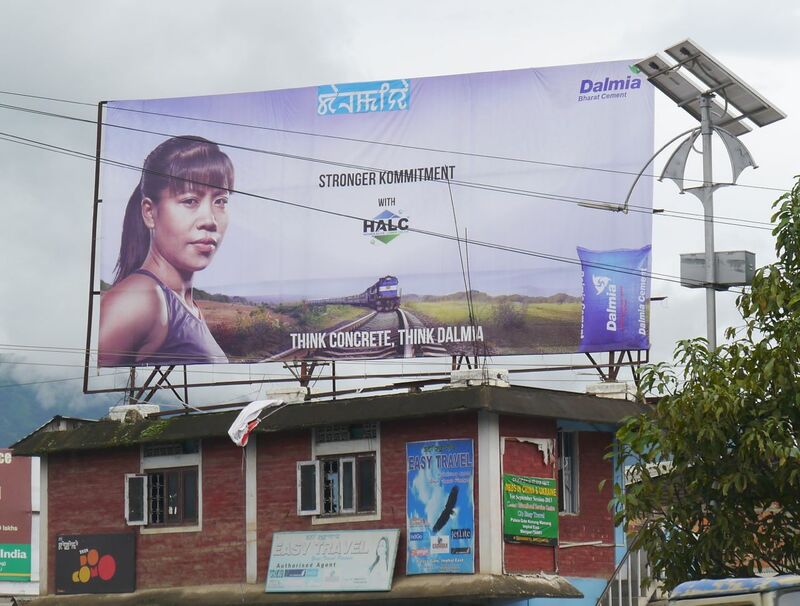 Manipur apparently feeds more top athletes than any other state to India’s national team. None more famous than London 2012 bronze-medallist boxer, Mary Kom (pictured, in a lovely instance of Indian puns). 7. The auto-rickshaws. 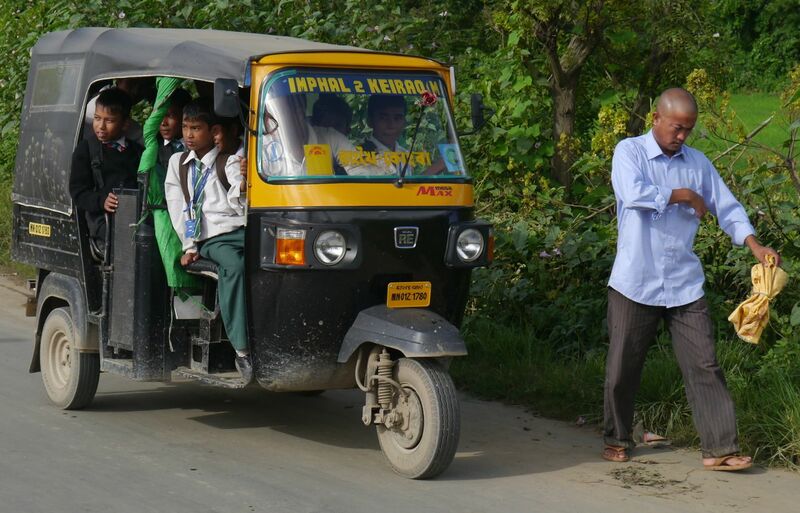 Unlike everywhere else in India I’ve been, in Manipur you cannot just hail an auto-rickshaw and get it to take you somewhere. People are sparse, the land is expansive, and there are frequent oil shortages due to the natural and man-made road closures. Hence each auto travels down a predetermined path, like a bus. You can hop on and off, sometimes sharing the auto, which here is the size of a small pick-up truck, with 10 others, including two or three squeezed next to the driver. Once we had to take three separate autos to make it back to the hotel from a far-off Thang-Ta centre. 8. Scenery. Mountains, rivers, waterfalls, valleys with lilies that grow nowhere else. 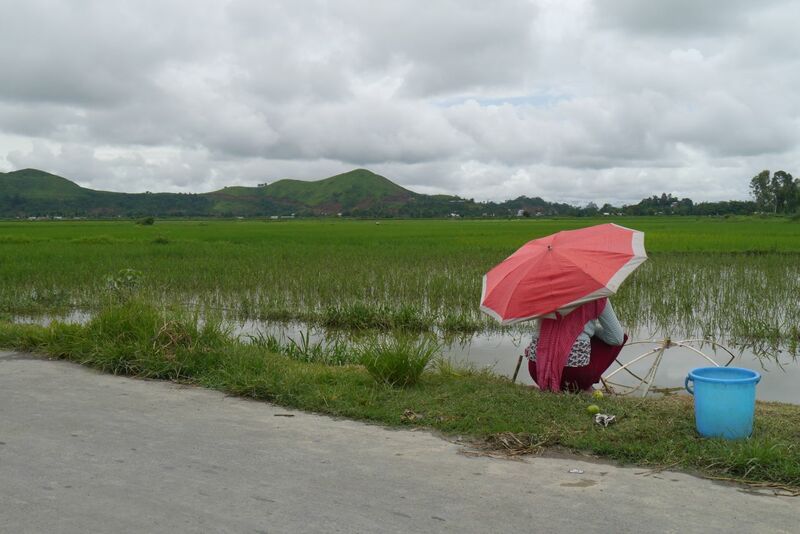 Manipur seems to have it all, and like some other conflict areas, including northern Malaysia and Sri Lanka, perhaps a silver lining of a decades-long insurgency that has left nature relatively untouched. 9. Food. 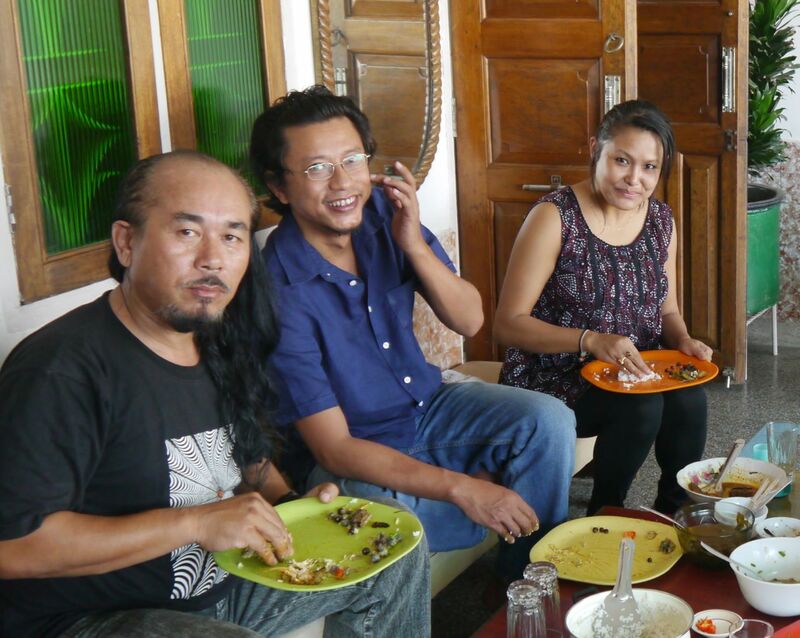 In a week in Manipur, I put on a couple of kilos. 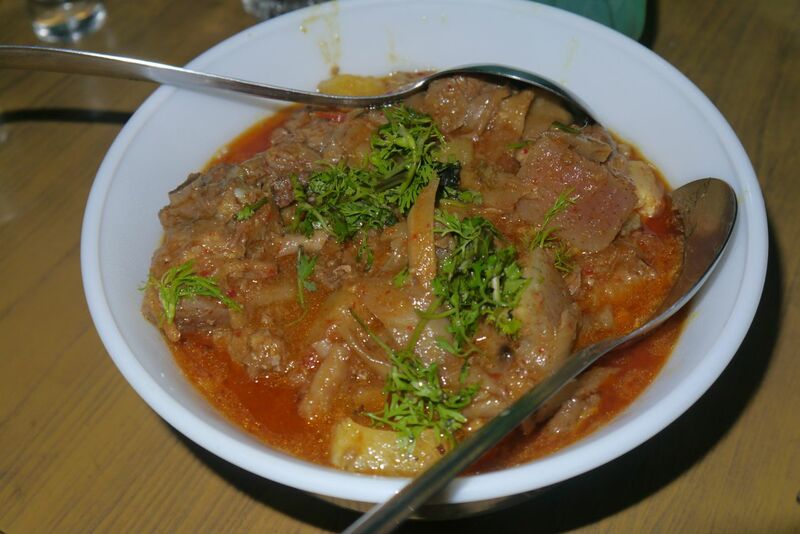 This is only because I overeat uncontrollably; the cuisine itself is fresh and clean, with oil used very sparingly. 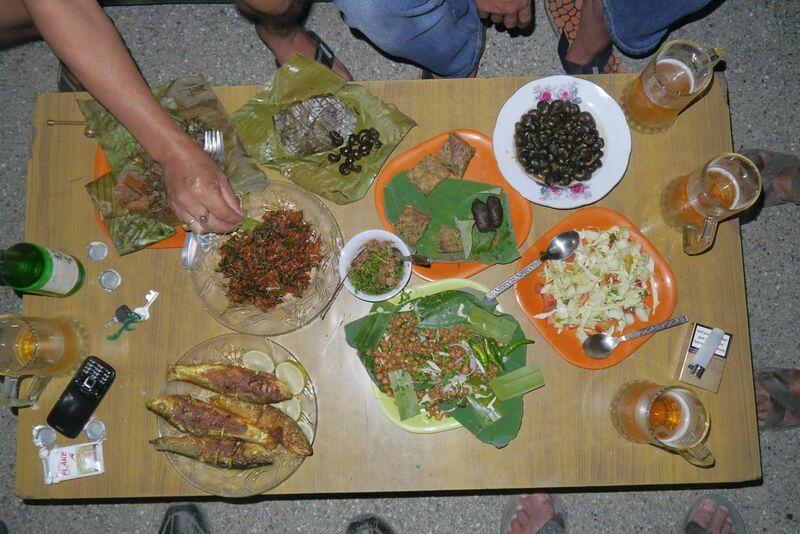 If I had to pick one single cuisine of this trip, it would be Manipuri. In a nutshell, it seems like a cross between Burmese and Thai, with a dash of Indian. 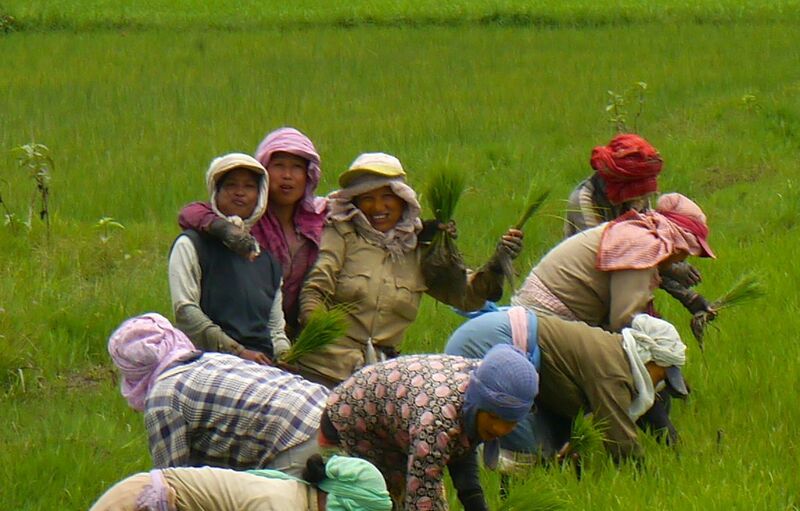 First, the rice is locally grown and unique. 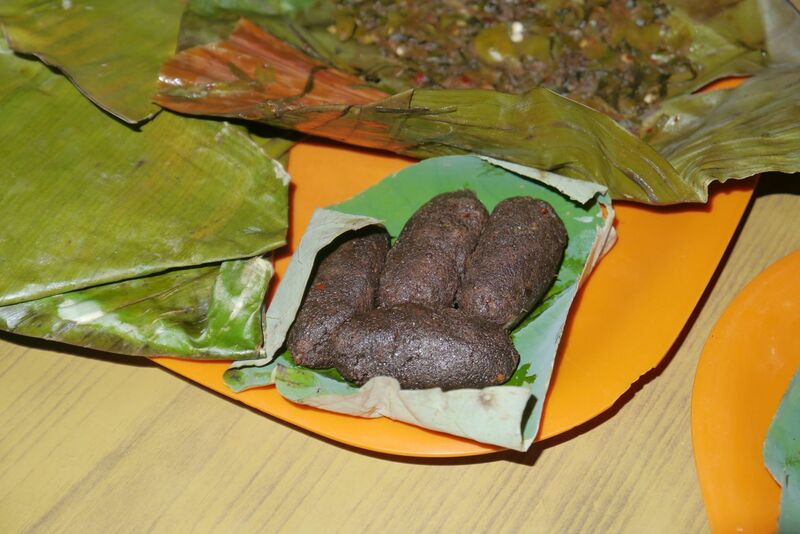 It is sticky, but not as sticky as Japanese rice; it is shaped like short-grained Kerala rice, and has some of the flavours of unpolished rice. Can’t get enough of it. Meanwhile, the vegetables and nuts and mushrooms and curries are so varied, like nothing I’ve tried before. 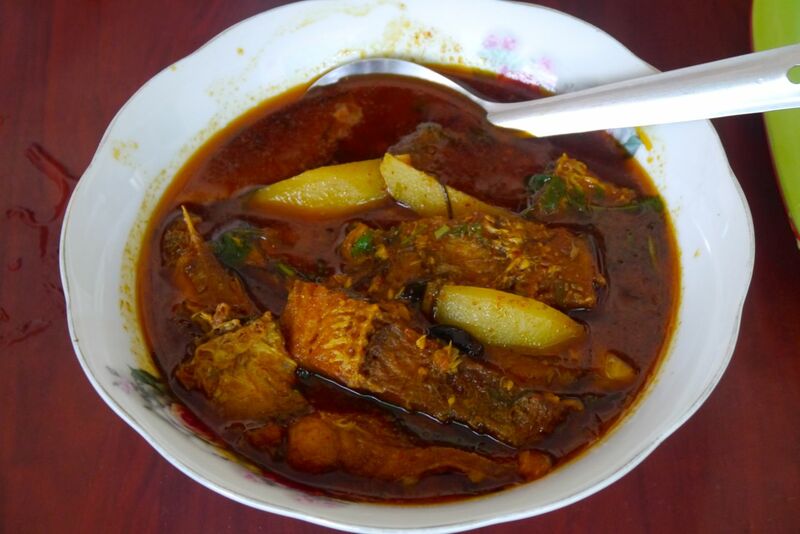 Manipuris love their fermentation, and you can expect to find fermented fish in many dishes. 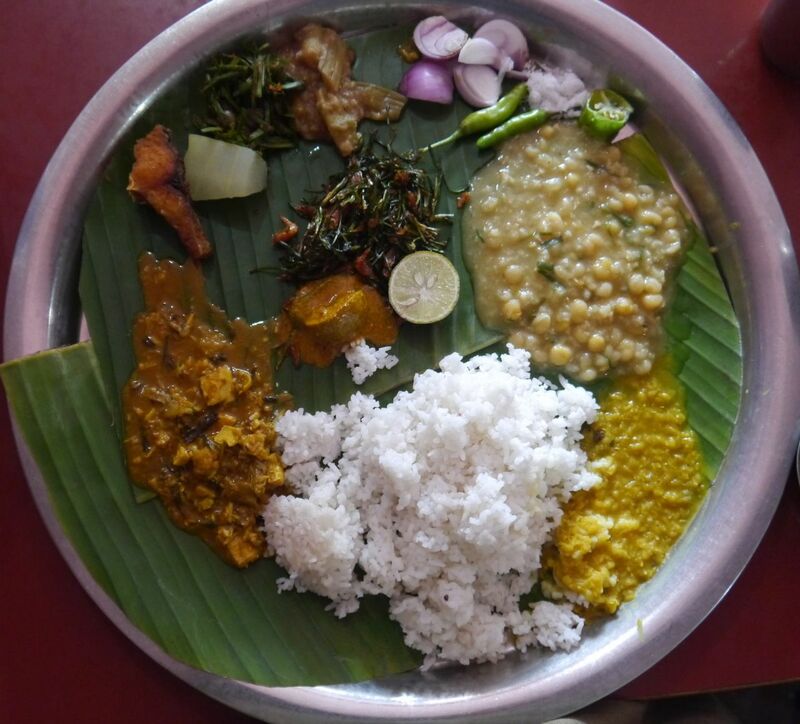 Every time we ate at Pushpa’s, there was an array of “snacks” or “bites” served before dinner, enough to fill you two times over (pictured). One of the best we had was a fermented black sesame cake. Another first for this trip: pork is sold and eaten everywhere. In many parts of India, you will often see butchers advertising “Fresh chicken”. 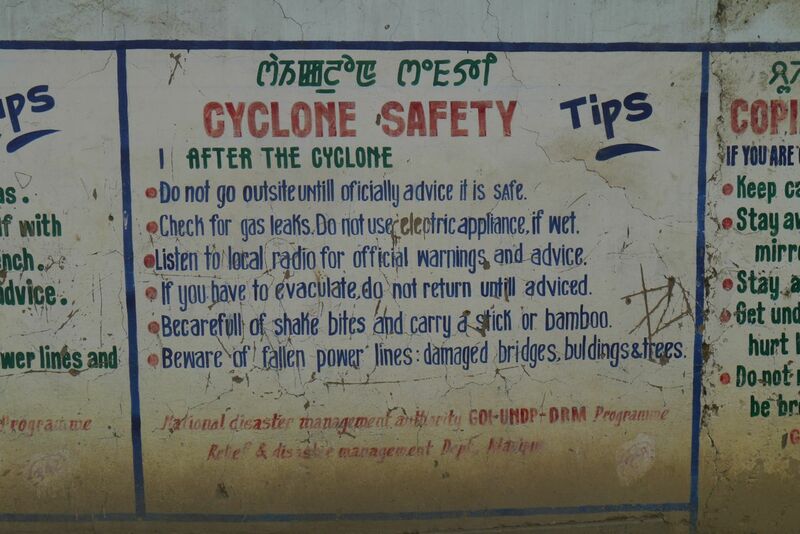 In Manipur these signs have often been replaced by “Fresh pork”. Pork, chicken and fish curries are staples here. 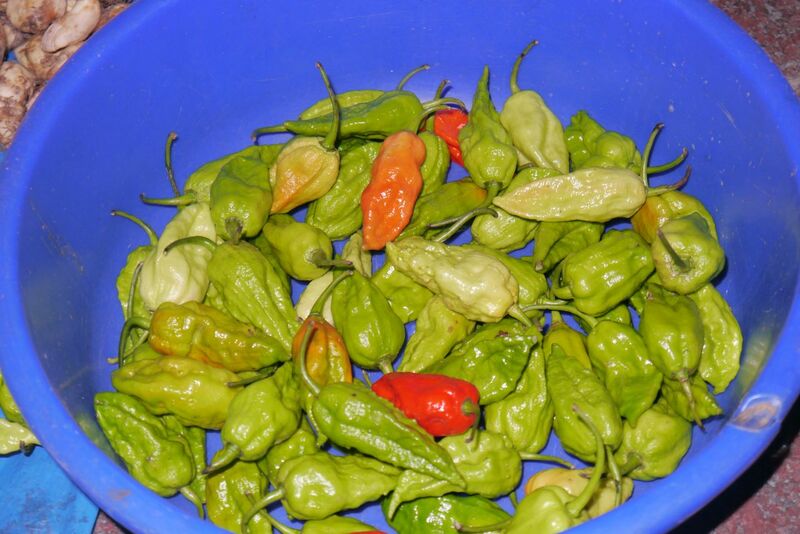 As a chilli fiend, I feel embarrassed that I did not know that the world’s hottest chilli, the bhut jolokia—literally ghost pepper—is grown in Manipur. For chilli nerds: Thai chillis score 100,000 on the Scoville scale, while the average Mexican habanero hits about 350,000. The bhut jolokia comes in at more than one million. And the Manipuris do not grow Oo-morok, as it is known here, to process it into bottles of hot sauces for afficionados near and far. Oo-morok—raw, unadulterated oo-morok—is simply part of the meal. On our first night there, Pushpa cuts one off a plant and serves it to us—Kirit and I manage a couple of nibbles. Subsequently, with every lunch thalli I have, I ask the stall owner for slices, to their undisguised amusement and admiration. 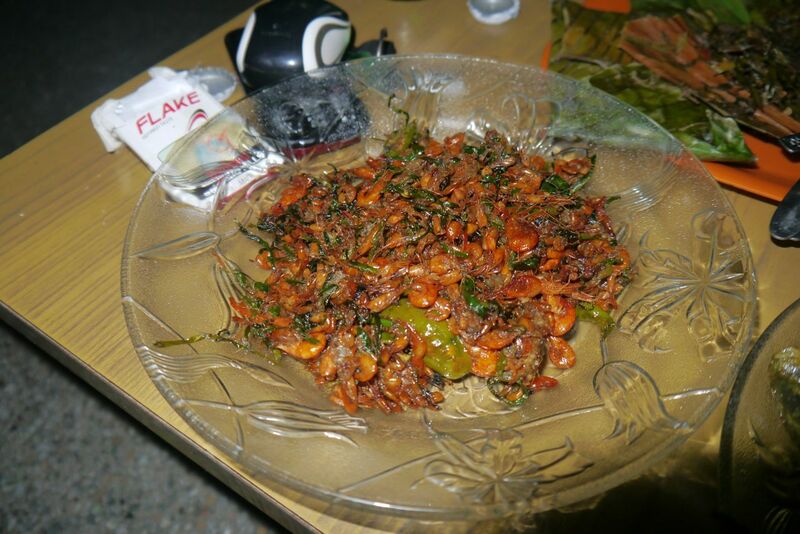 Additionally, oo-morok adds a little kick to many Manipuri dishes. 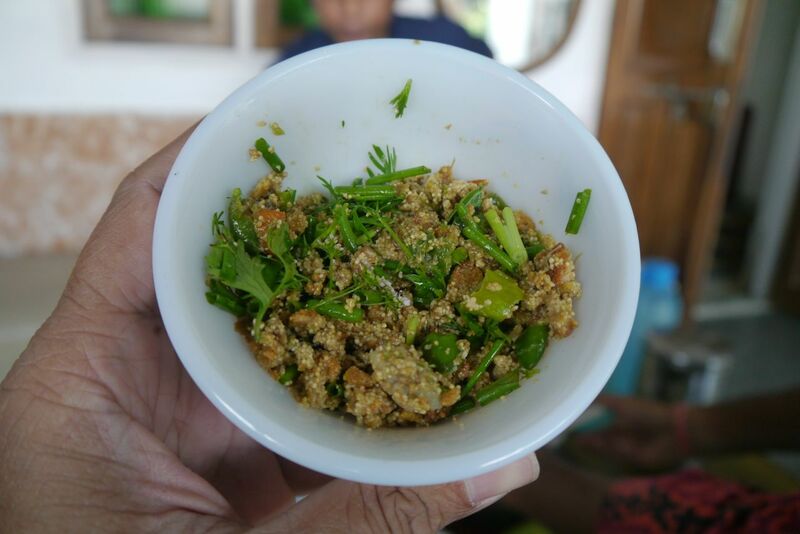 One of the best I had was a pickle that combined fish roe, oo-morok and fresh herbs (pictured). Divine. 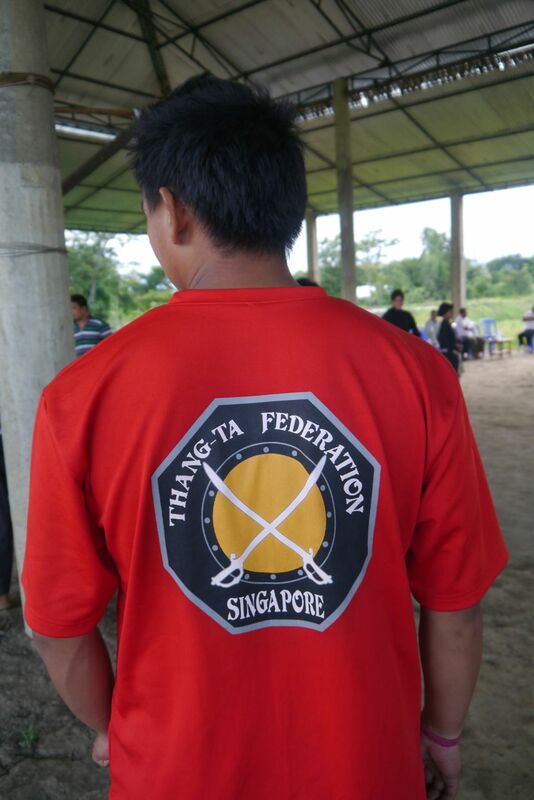 A few years ago, Singapore set up a Thang-Ta federation. When this guy heard we were coming, he put on this shirt he received from the team at a competition two years back. 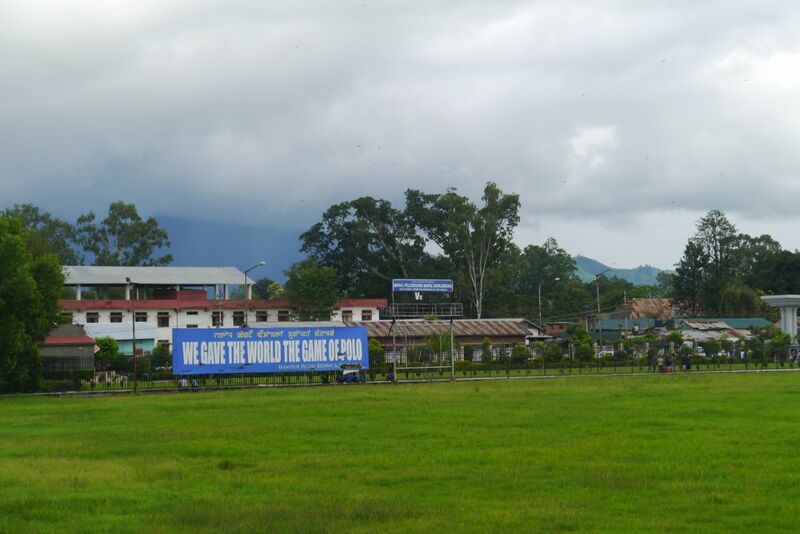 “We gave the world the game of polo”, at Manipur’s oldest polo ground. 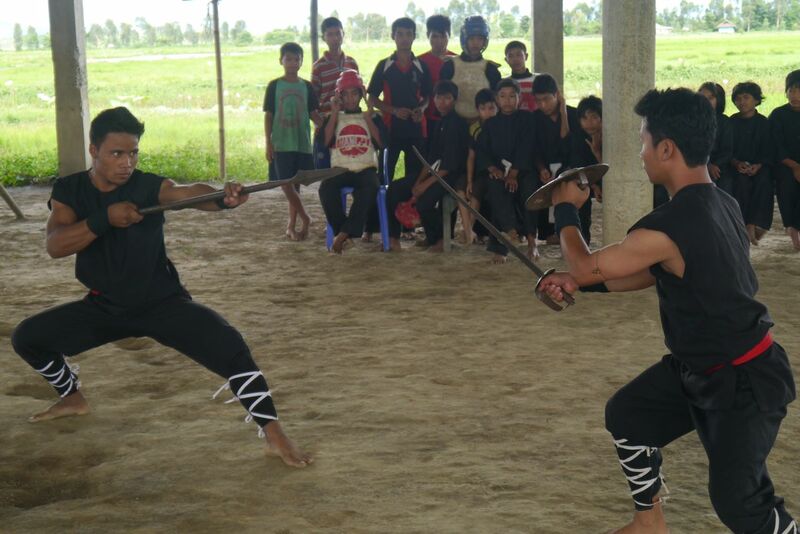 A very incisive glimpse into the life and culture of Manipur. I thoroughly enjoyed your well informed piece and cant wait for your reports on China. Keep it up and take care. Another great piece Sudhir. But I was intrigued about the ethnicity and politics of your friends. Deliberate discretion? Hi Simon! Not really. 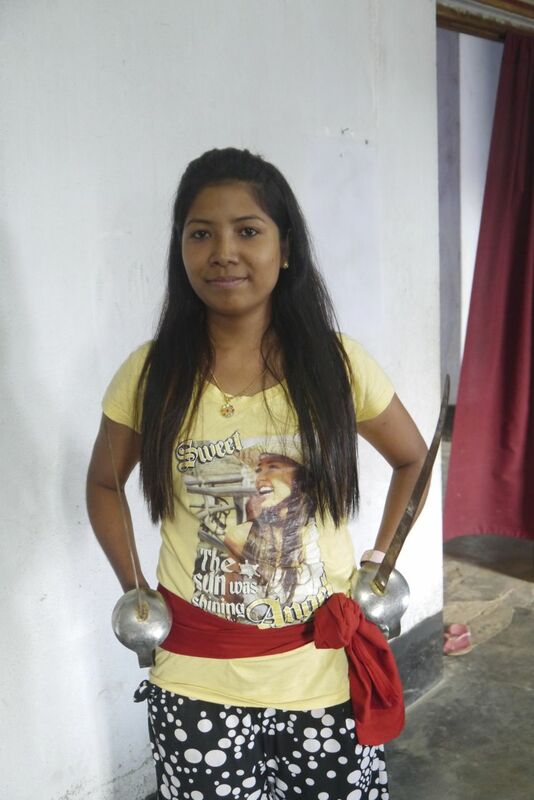 They are Meitei and, while clearly brimming with Manipuri pride, are happy Indians too. (while moaning about corrupt politicians and separatists.) Is that what you were asking? That’s nice. I’ll actually be in Manipur again Apr 13-19. Will you be there?